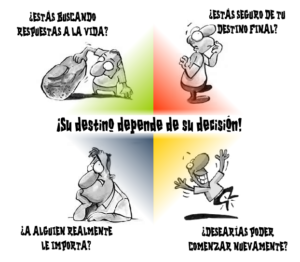 Spanish language illustrated through cartoons will help you understand how to be sure of your destiny. Cartoon characters in Spanish language illustrates how to reach your maximum potential. Cartoons in Spanish help people find love – God’s love and destiny. Cartoon network in Spanish language gives answers. Your destiny is your choice! This PDF in Spanish is composed of cartoons linking to one another taking you through the necessary steps in Indonesian to help you make a wise choice. Cartoons will help you understand how to be sure of your destiny and how to reach your God given potential. The reason why we chose cartoon pictures in Indonesian is because cartoons are a language everyone can understand and enjoy. In making a point some times words alone aren’t enough. A cartoon drawing communicates! By using cartoon art we have sought to make spirituality simple and fun. Step 2. Click here for a PDF in Spanish to learn how Jesus can meet your needs.